This topic contains 75 replies, has 6 voices, and was last updated by yegorvd 3 years, 12 months ago. 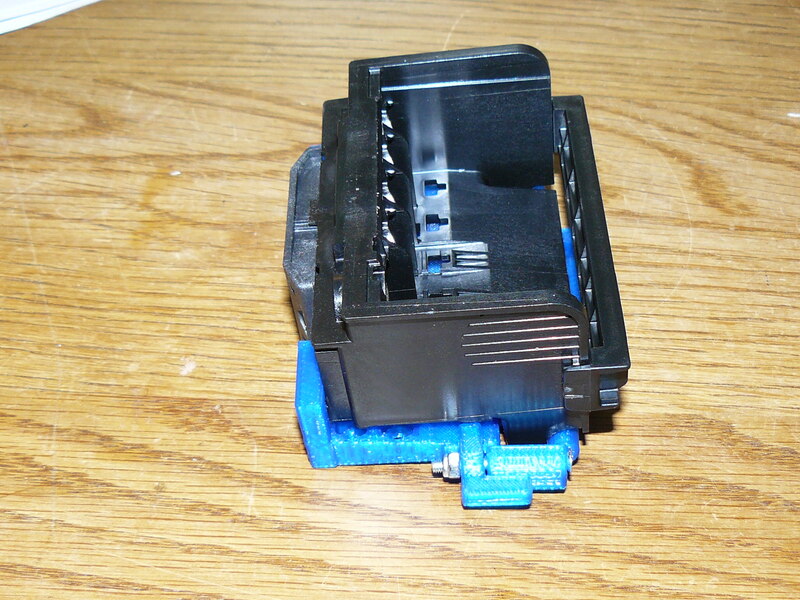 For the 3rd generation 3DP printers on Ytec, a new printhead needs to be used. The C6602 cartridges are easy to use, but they are inaccurate, have few nozzles, are big and require a lot of hacking.The next generation needs to be faster and more accurate. The C6602 simply won’t cut it anymore. At a minimum cost of around €350, it is the most expensive of the lot. That money does however buy a lot of quality, it is used in high end inkjet plotters and has at least 6 rows of colors. It is incredibly compact for the amount of nozzles and judging from the amount of contacts on the top, controlling it should be pretty straight forward. Not much else is know about this printhead. Ciss compatibility is also not quite known. Costing around €90, this cartridge is in the middle of the price range. It has 4 heads for colors and a separate, longer head for black. The resolution is pretty average. It too has reservoir cartridges. It should be CISS compatible, but no match has yet been found. The contact suggest a direct control. A small quantity of information about the contacts was found, but not enough to completely derive it’s function. Coming in 3 varieties, the BC-6n cartridges come in black/optimizer, photo and CMY. Average price is about €40 for a set and the technology seems quite old, so controlling it should be quite easy. The BC cartridges have no findable Ciss systems, otherwise there is no real information to be found. 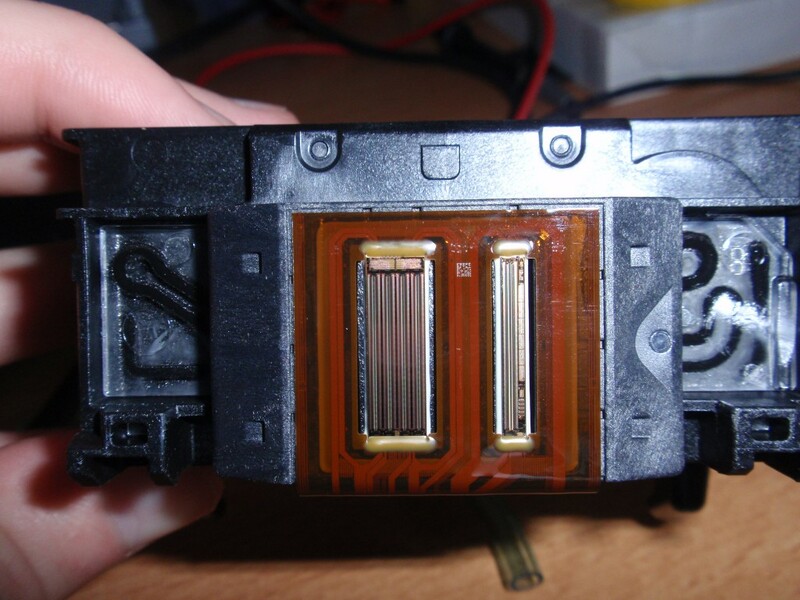 Interesting point though, you can remove the printing portion of the printhead. It says printhead on the package, so it must be good. It comes in 2 versions, a magenta/cyan and a black/yellow. Both cost around €60, so they are a bit spendy. They are used in professional plotters and have a very large row of nozzles. They are by default CISS, which is both good and bad, since we can’t fit an empty CISS system to it. Also the number of contacts is worrying. In the picture we clearly see 20 contacts, way too little to be simply wired. There must be a chip in the system (something which is confirmed by the information I found). This makes hacking it without a printer practically impossible. They are widely available and accurate, but the control and CISS compatibility might cause issues. The last printhead is also from HP. It goes back to a decade or so in printers, but is still employed in some new printers. 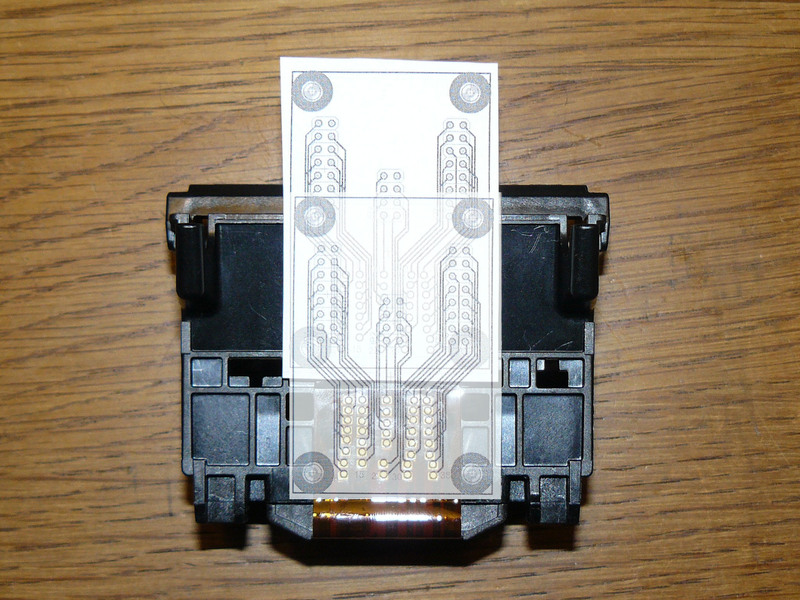 It is by far the most easily obtainable printhead and at a cost of around €60, it is also about the cheapest. It has 5 colors and an amount of contacts which give reason to believe it is directly wired to the nozzles. 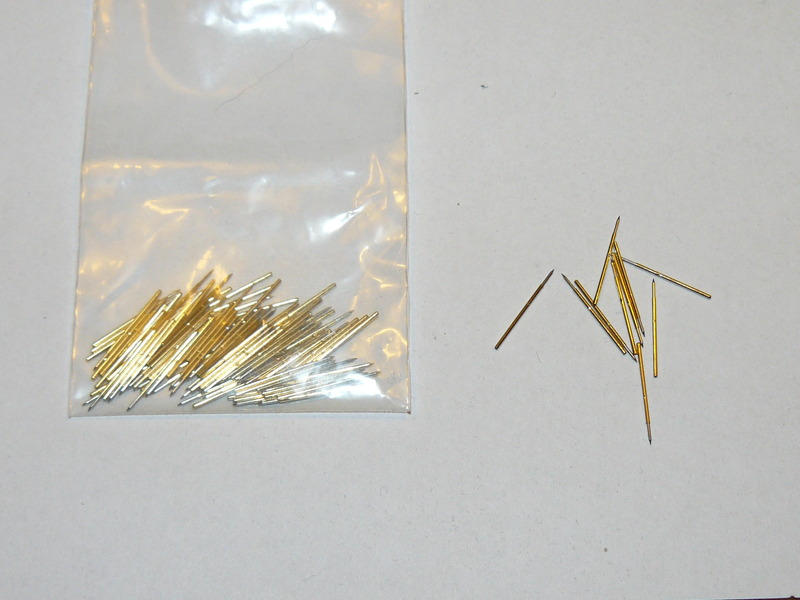 Getting a hold on a printer using these is nearly impossible, so it will only work if it is wired the right way. The 38 contacts suggest at most 2032 nozzles if they are multiplexed. 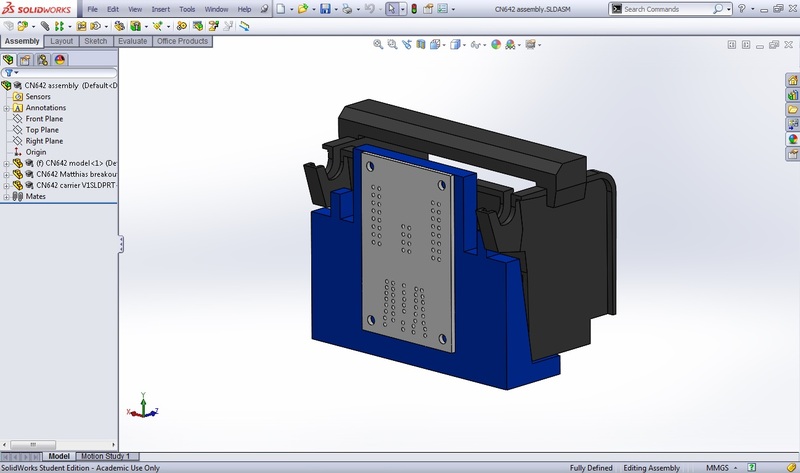 The printhead should work this way: http://www.google.com/patents/US5635968. 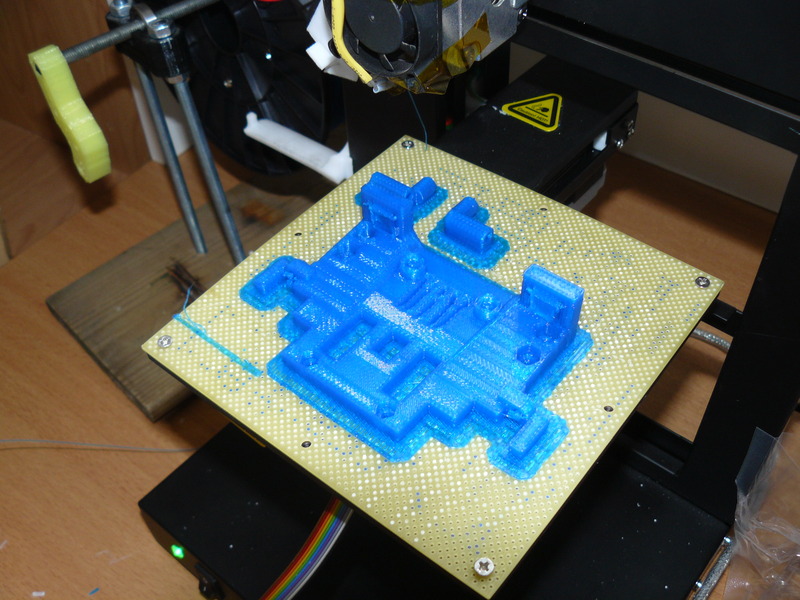 Most modern printheads from HP should still work this way and it is the only explanation to controlling that many nozzles with that little contacts. The CN642A has 1 other advantage. It is not only CISS compatible. It has several CISS systems available to it, some even completely empty. 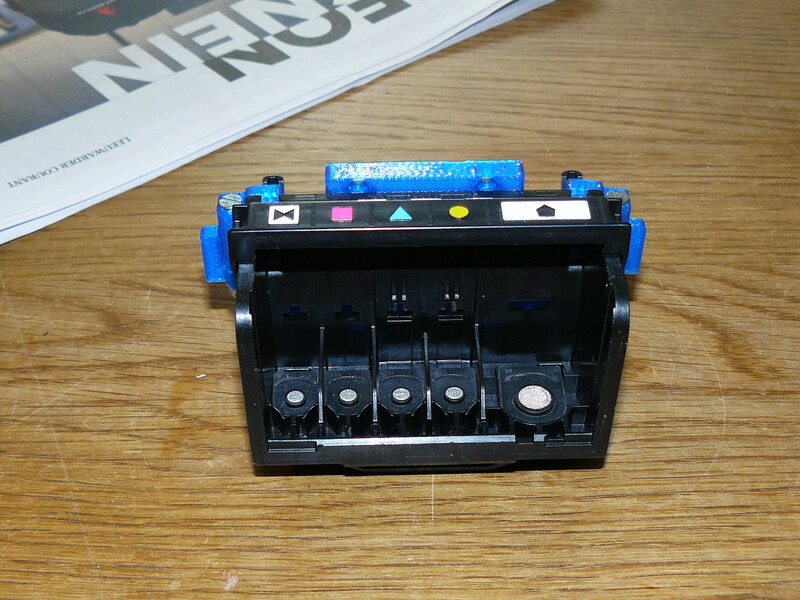 It uses HP364 cartridges which are really common, so a lot of time working around them has been spent. Best part, these CISS systems only cost €50-€70. A complete empty off the shelf full color printhead for €100. For all of these reasons and lack of better printheads elsewhere, First experiments will be conducted with the HP CN642A printhead. I have obtained one of these printheads. I will now figure out a way to interface with it by using a 3D printed holder and pogo pins. I have a printer with the CN642A in my office. Unfortunately it is incredibly dirty with ink, but I will nevertheless try to print test patterns with individual pins covered. The heads have a swash width of about 15mm. At 600dpi (is that the native resolution?) this would give us about 350 nozzles per color. One of the pins is likely a heat sensor. I would like to have a breakout board made that connects all pads on the cartridge via pogo pins to a standard 0.1″ pin header. I did start a bit of work already in eagle and I will post files as soon as they become usable. I created a little breakout board. What do you think? I have not printed it out to scale for testing yet. The Holes should be a little bit over 1mm in diameter so that the pogo pins will fit. 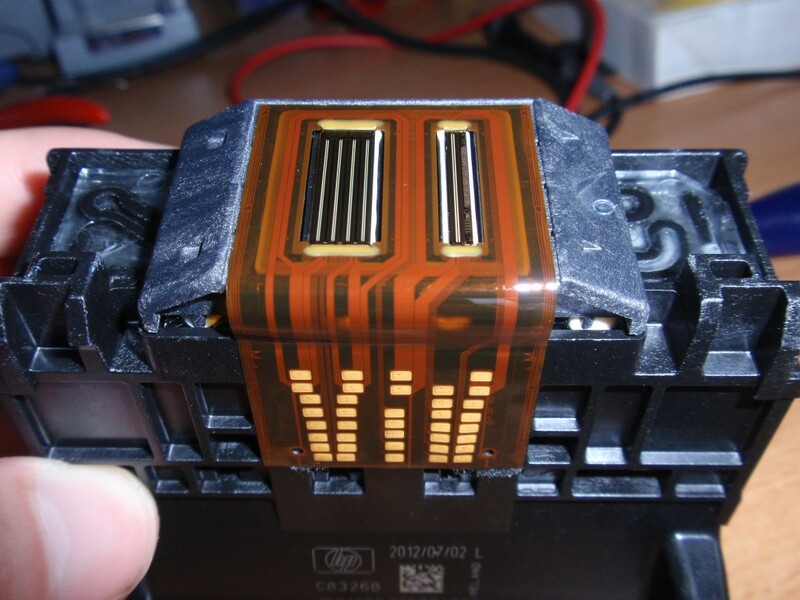 However, it would be nice to have that checked in a peer review before I send the files to a PCB maker. I printed it, took a picture and photoshopped your circuit on top of the contacts. It seems pretty close to me. I got 0.9mm by 16mm pogo pins, so mine should fit as well. Lets make a deal here, since you are in Germany and shipping isn’t that much. 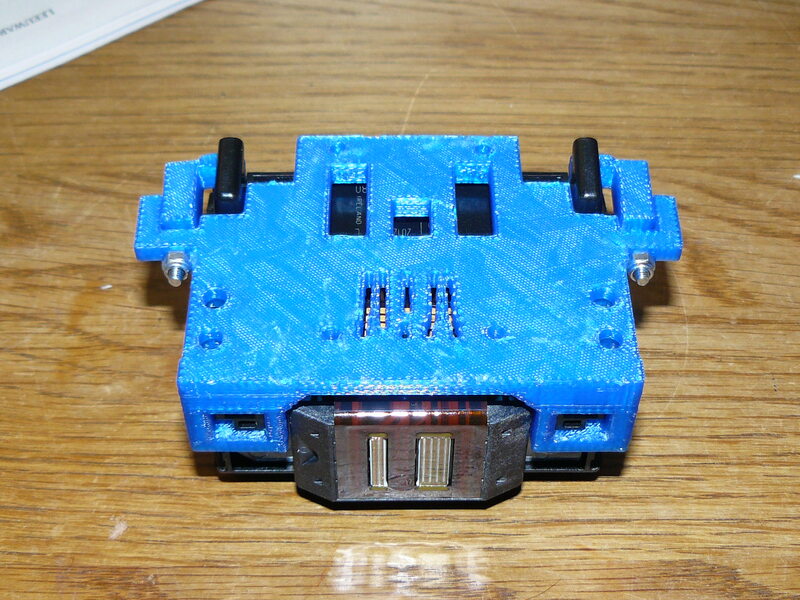 You get me 1 or 2 circuits, and I will 3D print a holder for it and send you one. That way we can both test. Sure. Sounds great. You could also send me the file. I have a pretty precise 3D printer here. I just ordered two boards for you. Still waiting for my pins though. I guess I shouldn’t have ordered them in China. Hahaha, yeah, I know. With the 3D case, make sure that the bottom is not lower than the nozzles, or the case will either drag in the powder, or the distance of the jets to the powder will be too far. I did receive my clean head today, so I can start testing a little bit more. The PCB had a technical error, so the circuit board maker is a day behind. It usually takes 5 days depending if they can fill the board. Using the numeration that I already put on the PCB, I did a bit of a testing matrix. There are some pretty clear results, and some not so clear. Obviously, pins 1-15, 21, and 22 are in charge of the black ink jets. The rest is likely in charge of the color jets. So for black, I get a maximum of 6x6x5=180 nozzles for a 14mm swash (326 dpi). 21 pins remain for a maximum of 7x7x7/4 = 85 nozzles per color or 150dpi. Unless of course there is more than a matrix inside the print head. possibly making the Mosfet switch. -/+ 1. 2. 3. 4. 5. 6. 7. 8.. 9. 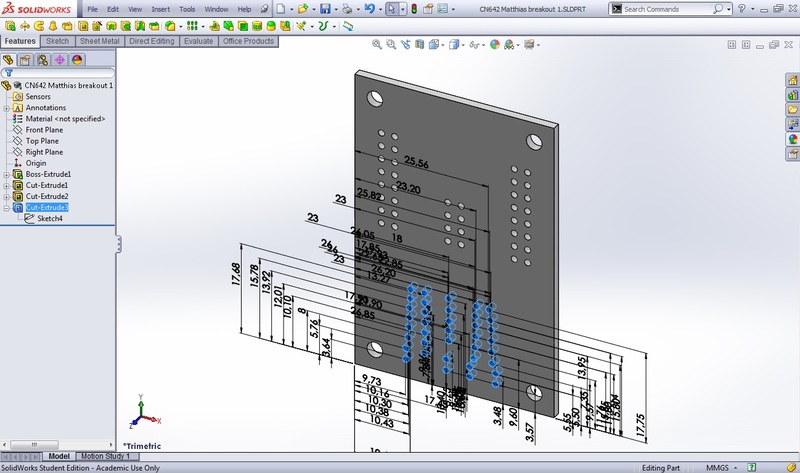 The measurement of the contacts will be useful, I myself didn’t have the guts to measure the contacts since the nozzles were designed to be on really briefly (<5us). I feared that putting my multimeter across it would ruin the heaters. I will see if I can decipher the data you got. It assembles with M3 screws (the longest being 30mm) and has very little support. I checked the contacts behind the holes, and everything seems to line up. I think it has plenty of room for improvement, but for the first experiments it will work. It also has 4 4mm holes on the back to attach the carrier to anything you want. If you want to have one 3D printed I can do that. If you think your printer is good enough for this part (It is <110mm wide) that is fine too. When you have your circuits I'd be really interested in getting one so I can test here too. This reply was modified 4 years, 7 months ago by dragonator. Could you please add the link to the 3D object. It seems it was lost. My printer should be good enough. I managed to get my scope running and I hope to find some time to measure a few pins tomorrow. Somehow my own site wouldn’t let me post a reply in my own topic on my own forum. Link was edited in. I got my pogo pins. When your circuit arrives I will make the connection. All I need after that is an ink supply and I am ready to test if I can trigger nozzles. Careful with those tips. They may damage the foil contacts. Maybe you need to flatten the tip a little with a file. My Pogo Pins arrived as well today. China is far.